Born in Israel in 1965, Zohar’s artistic passion started at a very young age when she used to experiment with organic components and use it in her creations. She completed her Bachelors of Arts degree in Haifa University, followed by Handwriting Analysis studies. Zohar later joined the corporate world as a human resources consultant. It was only after she moved to Canada in 1998, that Zohar finally became a professional artist, as the vibrant local colors captured her heart and inspired her to pursue her original passion. Zohar has an intuitive approach which incorporates dynamic sequences into the most trivial elements. 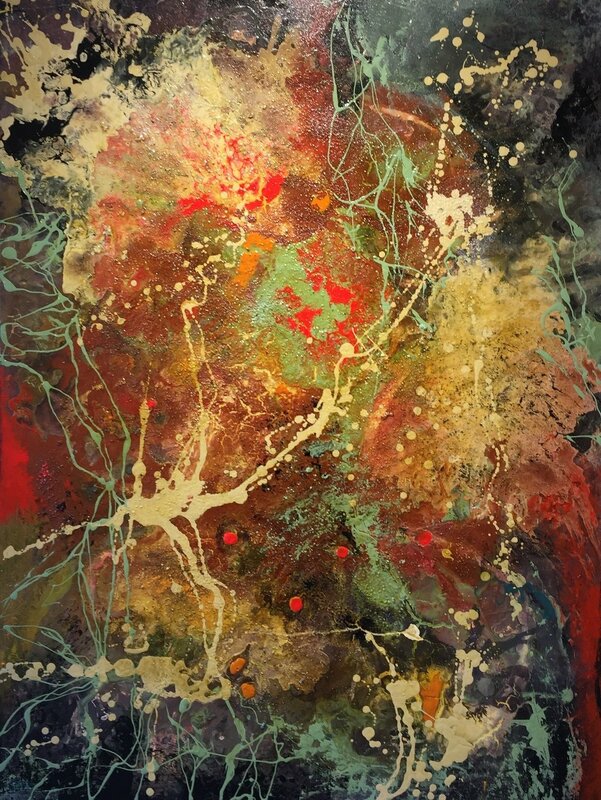 Over the years she developed her unique style of work by applying thick layers of paint and sand onto the canvas, letting it determine the course of the image. Working with her hands, she continually modifies each layer by peeling and distressing it, and adding new pigments as she goes along. She allows the spontaneous alchemy between her mediums to unfold and follow natural elements that start to form within the layers. Her process is highly intensive and each work takes several weeks to complete as the different layers dry and become a new denotation. Zohar’s interest in natural mechanisms and organic elements is reflected in her work. She demonstrates a keen sensitivity to those basics, turning subtle variations in texture and tone into images with a powerful physicality and an otherworldly sense of mystery. Her skill at handling color, combined with her strong compositions, result in works that vividly project a sense of space, depth and movement. The visual world she creates is engaged in a process of transformation and change, presenting to the viewer reflections on natural forces that shape different structures found in nature. Zohar’s paintings are being sought after by corporate and private collections all over the world. She resides with her family in Calgary, Canada. Fascinated by natural chemistry I am constantly exploring depth and substance, connecting visual essentials through colour, texture and form. Random and insignificant details catch my attention as I highlight elements that were buried below the surface. I learn to trust my intuition and remain open to unexpected forms of inspiration that surprise and move me throughout the process; always relate to the progression as an amazing adventure. As soon as I follow the same pattern something shifts and changes, as the language of the forming piece becomes dominant and guides my way. I choose to distress and manipulate the layers I create in search for a new path, while the different layers grow into a new meaning of their own. Repetitive, yet lively movements create definite deposits as the painting slowly forms underneath my fingers. Then it takes control and functions as a living being, while the layers blend and shift into each other naturally. Patterns and natural elements fascinate me as I try to find a mutual language between the different mediums. I aim to discover harmony within the most trivial elements, while focusing on the experience itself as I let the process guide me, never knowing how or when it will end. Each piece formulates within a few weeks as I listen to the authenticity of the moment and let it decide its course naturally. I’m interested in capturing the essence of time. With shifting the focus on here and now, every new detail that emerges into the surface brings a new attention and definition. Forcing us to concentrate for a second before we move on.